To give our clients 100% peace of mind. 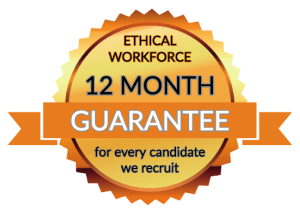 Ethical Workforce is the first search & selection company in The UK to offer what we consider are a set of unique and exclusive Terms of Business to all our clients who engage our services. We give a 7 day cooling off period for the client so that both parties can ascertain if they are mutually happy and comfortable. On day 7, the consultant who made the placement will contact both parties to check all is fine and well and will only proceed with invoicing the client following this. This gives all our clients 100% peace of mind and that their business interests are being looked after by us. Our business model is based on long term working relationships with all clients and we are not solely revenue or bottom line focused or driven but motivated by success in delivering a high standard of service and quality candidates. So, when we say you have absolutely nothing to lose by working with us; we mean that literally! Our guarantee is a testament to our high service standards.